It was one of the best moments ever. I am in a natural food store my friend, Jenn, had been wanting to take me to for years, while in Columbus, Ohio (Raisin Rack is the store). The aisles and aisles of gluten-free products are calling to me. Like…literally. I’m getting all whiney and needy and really, really wanting to try some items that I hadn’t found anywhere else. And my roomie comes over with a medium-size basket and tells me to fill it up. One of the products that she insisted that we try was Bella Lucia Lemon Love Gluten-Free Pizzelle. Why? Because it had the word “lemon” on it. And we had seen these before at our Whole Foods and never picked them up. Second chance. We’re taking it. What are pizzelle? A pizzella is a traditional Italian waffle cookie that is made from flour, eggs, sugar, butter, and flavoring (like…in this case…lemon!). 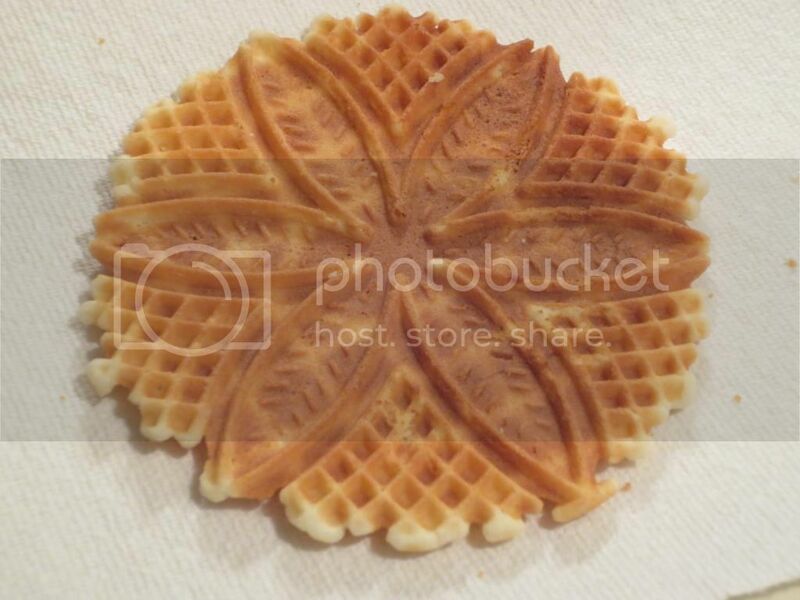 Depending on how they are prepared, pizzelle can be hard and crisp or soft and chewy. These are known to be one of the oldest forms of cookies. The cookie dough batter is put into a pizzelle iron (sort of like a waffle iron). They are typically stamped in a snowflake pattern on both sides. These cookies are thin, golden, and usually crisp in texture once it’s cooled. I had never had pizzelle before, so I was already intrigued. After we polished off some dinner (leftovers from the Corn & Black Bean Salad I posted about in my “Cooking With Amy Farrah Fowler” blog), I cleaned up the dishes and pulled the plastic container out of the pantry so we could enjoy some dessert. I opened up the container and removed the sealed cookies. I carefully cut into the seal and eased out two thin cookies, handing one over to Cathy while I kept the other one for myself. These cookies are so light and thin. Loved that. I wouldn’t feel guilty when the dessert I’m “indulging” in doesn’t feel heavy and fattening. HAHA! I took a bite. The Bella Lucia Lemon Love Gluten-Free Pizzelle is of the soft and chewy type. I was really, really expecting them to be crunchy. Everything about them screamed crunchy. I think I was slightly disappointed that they lacked crunch. But…even more…the lack of lemon flavor was a bigger disappointment. And what I could taste was almost…fake in flavor. They also seemed a bit…dry. As I have never had pizzelle before, I don’t know if this is normal or not, but it was a bit of a letdown in the end. The cookies look beautiful. But they really lack in the texture and flavor. At least this version of them. 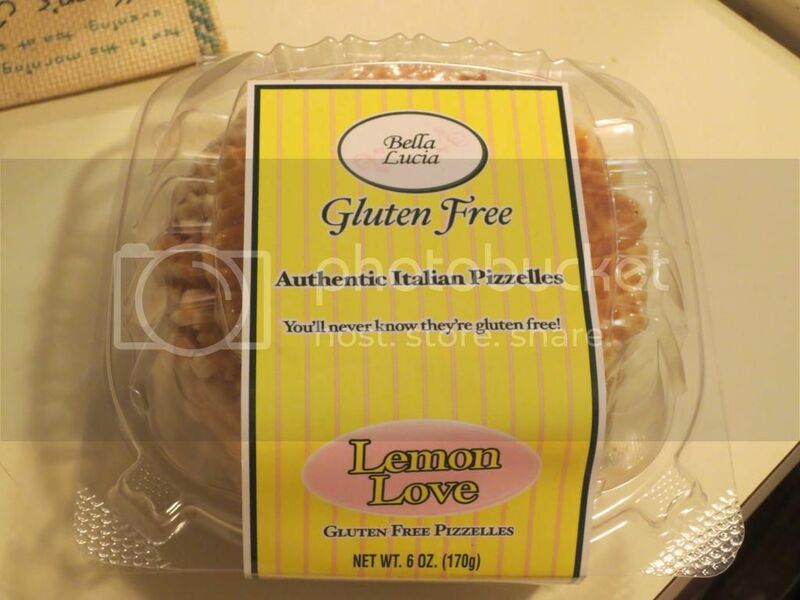 I’d be willing to try the other flavors of gluten-free pizzelle offered by Bella Lucia…but the Lemon Love were slightly disappointing. At least for me. Ingredients in the Bella Lucia Lemon Love Gluten-Free Pizzelle include white rice flour, brown rice flour, tapioca starch, potato starch, potato flour, xanthan gum, pectin, sugar, canola oil, eggs, and lemon extract. They are gluten-free…the founders wanting to make traditional baked goods that would meet new dietary needs without giving up flavor and taste. As for nutrition information, a serving size of the Bella Lucia Lemon Love Gluten-Free Pizzelle is one cookie. Just one. This serving will give you 100 calories and 4.2 grams of fat. In addition, you will be consuming 28.8 mg cholesterol, 6.3 grams of sugar, and 9.5 mg sodium. Finally, you will be taking in less than 1 gram of fiber and only 1.3 grams of protein. So…don’t expect these cookies to fill you up. They won’t. I expected something completely different in a pizzelle. And while I’m not totally disappointed, I’m not entirely impressed either. I love what Bella Lucia is doing. And I think I might have enjoyed it more with more lemon flavor infused…but these were just a little bland. And not crispy. When I get a thin cookie…I want some crunch to it. So, slightly lacking. But not bad. Not amazing. But not bad. This entry was posted in Baked Goods, Cookies, Dessert, Food, Gluten-Free, Products, Review, Snacks, Sweet Stuff, Vegetarian, Waffles by The Celiathlete. Bookmark the permalink.